A great mixture of Doyle and Wells! “The Curious Case of the Sleeper” by Stephen Herczeg delves into a tale more reminiscent of Washington Irving than HG Wells. I did enjoy this story, bravo! “The Manor House Horror” by Michael Silverling ties for Best-in-book! It combines nuances of The War of the Worlds, The Island of Dr. Moreau, and The Invisible Man! The flow is seamless and the action superb! My hat is off to the author! 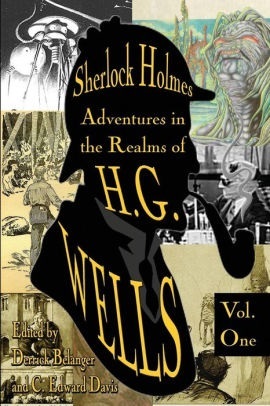 “The Adventure of the Traveler’s Bootstraps” by Campbell Powell has Holmes meet the Time Traveler. The twist in the tale is quite amazing! “A Matter of Some Gravity” by Derrick Belanger is an excellent read! People and events from The First Men in the Moon weave in and out of the story. I’ve seldom seen the type of narration this story presents. Some people may accuse me of kissing up, but this story ties for best-in-book! I couldn’t with a clean conscience give this exciting book anything less than five stars plus! It is a refreshing blend of Holmes and Wells!